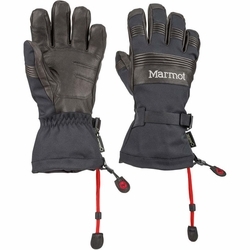 Marmot Ultimate Ski Gloves. No other glove compares for warmth and durability. The Ultimate is a rugged, leather, GORE-TEX and MemBrain glove with a long history of unmatched performance. Updated with more leather on the back of the hand, and accordion folds on the knuckles that add more dexterity.